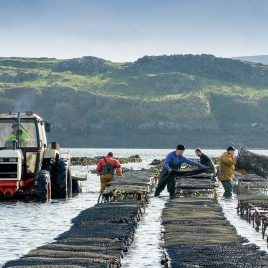 All of our oysters thrive in the pristine waters of Ballinakill Bay. Our oysters enjoy a unique habitat in the sheltered bay, influenced and refreshed by the North Atlantic drift and other subsurface currents. The tour lasts approximately 1 hour and goes through the whole process of how the farm brings the oysters from seeds right through to your plate. During spring tides, they run longer tours as you get to experience a seashore walk and see the different stages of growth in the water. Visitors can also enjoy the fruits of the farm as they can purchase some fresh oysters to bring home with them. The tours are suitable for anyone aged 6 years and up and must be booked in advance. It is a truly a hands on experience as it is very much a working farm.